Looking to shake things up a bit in the bedroom? This unique, industrial nightstand is just the one for you. 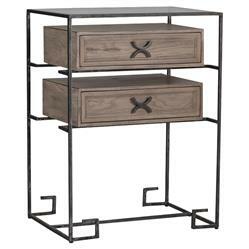 With a sleek, black metal frame and two floating oak drawers, the piece is perfect for modern city lofts and rustic country lodges alike. A sheet of clear glass caps off the bedside table, furthering the open, minimalist appeal.